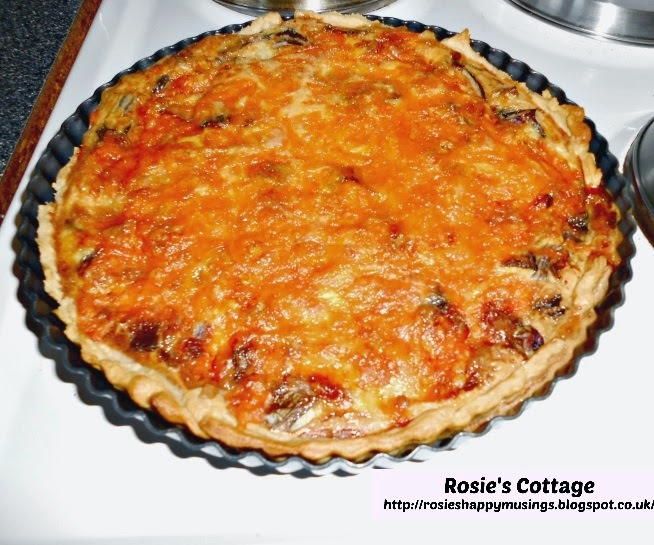 Rosie's Cottage: Super Easy Two Cheese & Red Onion Quiche! This is one of our favourite quiche recipes, and is the one that I make most often. 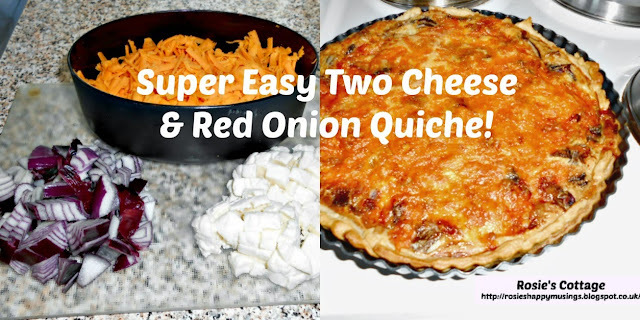 In this one I've used mozzarella & red Leicester cheeses with red onions but I've also used Scottish mature cheddar (a favourite of Hubby) very often too, who doesn't love Scottish cheddar? yum! NOTE: replace the red Leicester with your own favourite red cheese if you prefer. 2. Cut 55g from your block of butter or margarine and cut into small cubes. Add these cubes to your mixing bowl and mix using your fingertips until it looks like rough breadcrumbs. Be careful not to "over mix" or touch it for too long to prevent it becoming "greasy" because the heat from your hands will melt the butter if touched for too long. NOTE: Your shortcrust pastry case should be "baked blind." Essentially this means to place a piece of grease-proof paper/wax parchment on top of the pastry, and using "baking beans" to weight the pastry down whilst baking. Ceramic baking beans can be bought and are re-usable over & over again but I use white rice poured over the grease-proof paper, removed when the flan case is baked and stored in a mason jar to be used again for the same purpose. Alternatively, use a flan dish in a size smaller and sit it inside your flan tin on top of the grease-proof paper. This is done to prevent your pastry "bubbling" during baking and keeping its shape. 6. Carefully place your flan tin into pre-heated oven, middle shelf, at 160C or 310F for 14-15 minutes. Remove from oven, carefully removing your weighted greaseproof paper. Place back into the oven for 4-5 minutes until surface is golden. Set flan tin aside until needed. KEEP pastry case in the baking tin as it will be going back into the oven. 7. Next, finely chop your onion. Place your onion in a frying pan with a little olive oil (or butter/margarine would be fine too honeys.) I've used a red onion because we like them but it's fine to use a brown onion too. 8. Gently fry the onion over a medium heat, taking care not to let it burn, for 3-4 minutes until cooked. place a couple of sheets of kitchen paper onto a plate and place cooked onions onto the paper to remove any excess oil. Set your onion to one side for now. 9. Slice your mozzarella cheese into smallish pieces and, like the onion, set to one side. Grate your Red Leicester cheese. 10. Collect a mixing bowl and a whisk (or fork.) To the mixing bowl add your 3 medium eggs, beat your eggs together. 11. Add your mozzarella cheese to the eggs in your bowl, add about 2/3rds of the red Leicester cheese, as well as the onions. Fold or stir gently (don't whisk again) to make sure all of your ingredients are combined with the egg. 12. Pour the egg, cheeses & onion mixture into your flan case. Before returning the flan case to the oven scatter the remaining 1/3rd of the red cheese over the top. Bake uncovered on the middle shelf, at 160C/320F, until your egg mixture is cooked. The flan is done when the egg mixture is set, ie: you'll be able to poke the middle with a skewer or a knife and it will come out clean. This should be around 15 - 18 minutes. Slice, serve and enjoy :) We had this for dinner last night with a side portion of fries and it was lovely! I love cheese, and this looks super cheesy yummy !! ps: I love your new blog design, it looks fantastic x .